Total Election Day votes in the governor’s race: 7.3 million. Total unprocessed votes as of today: 4.9 million. Total eligible voters: 25.2 million. There are still a few counties not reporting everything, so the total number of votes will continue to increase by maybe half a million votes. The likely final number of votes is approximately 12.7 million. Total turnout when everything is finally finished: probably about 50 percent. 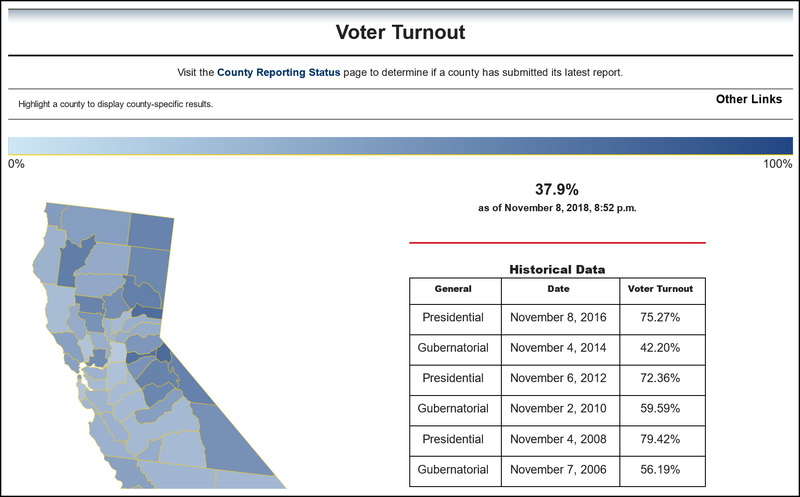 Turnout in California was almost certainly a smidge higher than the national average. Unfortunately, we won’t have a final answer for another month or so. I don’t know why, but that’s how things work here in the center of the Resistance.